A carefree ride can not live without a safe protector. Pet seat cover, a solid soldier of your car as well as of your pets. This pet seat cover is made with oxford fabric. Keep your seat from any dirt, scratches, hair & fur. Etc. Measuring approximately 54×58 inches, it is perfect size for most standard cars and family SUVs. And it can accommodate any small to large sized pets of all kind, no matter family journey or friends gathering, you can enjoy it with your pets. This pet seat cover is mainly designed for standard cars, trucks and SUVs, so please make sure to measure the size of your car’s seat and then purchase. TWO PORKECTS FOR STORAGE: Made with two pockets, you can store your personal objects like your water bottle, tissue, screwdriver .etc. Or other pet items you using on your pets. And the items won’t fall out with buttoning up the porkects. WEARPROOF: Constructed out of heavy-duty oxford fabric. Totally keep your seat from any dirt, scratches, hair & fur. Etc. No more endless sweep. 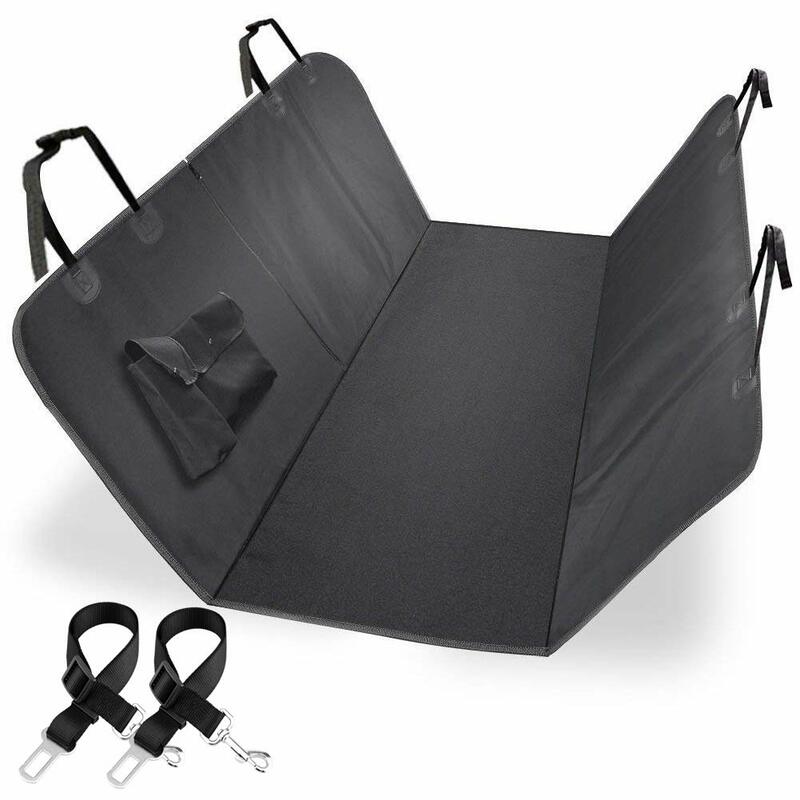 HAMMOCK CONVERTIBLE: 54″ x 58″. Designed for the backseats of Standard Cars, Trucks, & SUVs. It can be converted between hammock or original bench style with the zip, you can choose any stlye you want. Nonslip & SAFE: Seat anchor can be inserted to the crevice to fasten the cover, 4 sets of adjustable plastic clipsthat attach around the headrest in the front to fix cover firmly. Provide you a comfortable and safe driving. EASY TO INSTALL & CLEAN: Easy to install with quick release clips. Just snap the buckle straps around your car’s headrests and insert the seat anchors. Easy to clean with a damp cloth or vacuum.